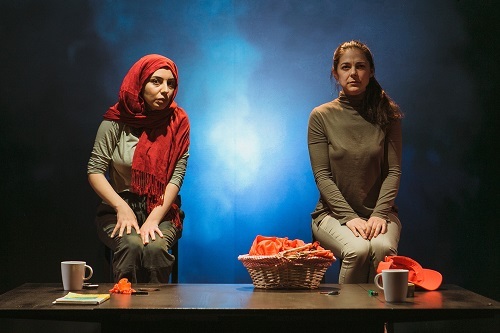 “It’s complicated” is a phrase often heard throughout the play Two Birds One Stone, currently playing as a part of the RISER Project program at The Theatre Centre, whenever co-creator/performer Natasha Greenblatt is asked to comment on the contentious relationship between Israel and Palestine. While the situation is indeed “complicated,” this nebulous term is often used to discourage or deter much-needed investigation and analysis. Fortunately, Greenblatt and Palestinian co-creator/performer Rimah Jabr do not shy away from any complexity in their account of what it means to search for identity on conflicted and occupied territories. Facing dwindling opportunities and needing a reprieve from familial obligations, Rimah travels out of Palestine for a residency in Brussels where she seems to do badly at everything except when she performs her “traumas.” Natasha decides to search for lost family history on a Birthright trip to Israel in hopes of distancing herself from the pain of losing her brother. By weaving their stories together on one stage, Jabr and Greenblatt become visual reminders of how cultural and political identities are irrevocably linked – just like the histories of Israel and Palestine. This play is the perfect example of why theatre, why art, is so important – especially right now. We can be so wrapped up in headlines that we forget about the people behind these “hot topics,” whose lives can never be fully captured by an article or a newsreel. It wasn’t until I heard Jabr’s story that I realized I had no idea about what it was like to actually live in Palestine. Similarly, Greenblatt’s thoughtful portrayal of her own privileged journey encouraged me to reflect upon my own privileged ignorance. While Greenblatt is the more vibrant performer, Jabr’s “dry, realistic” (as she describes it herself in the play) delivery was a nice foil to Greenblatt’s liveliness. What really stood out to me, however, was the quality of the writing and the seemingly effortless transitions between stories. The care taken in the construction of the piece was evident. There were many thematic connections and payoffs that were a delight to notice and think about. This is not to say that there weren’t plenty of surprises too, but no matter when or where the creators took us, the play never felt disjointed. While I found the production to be very polished overall, there were a few technical elements that I felt could have been more refined. In particular, the projections were sometimes too bright compared to the stage lighting and would distract, rather than compliment, the action on stage. I also thought that the ending could be tightened: the lights came up too quickly, which dispersed focus from the poignant last scene, and the bit with a clementine took too long to set up. However, none of these issues detracted too much from a generally well-done production that successfully makes the political personal. In the penultimate scene, Rimah and Natasha recount their experiences side-by-side of trying to locate the home of their grandparents. Natasha is able to search and travel with a buoyant freedom while Rimah is blocked by bureaucratic barriers at every turn. Like they do in much of the play, Jabr and Greenblatt compel us to examine how the privileges we possess and/or the oppression we face are shaped by our perceived political, cultural identities. How have our lives, our experiences been shaped by how others perceive us? Who is denied entry? Who can access their history and who cannot? How can you figure out who you are if you are not allowed to know the place you come from? Two Birds One Stone does not claim to have all the answers, but the show certainly asks all the right questions. Two Birds One Stone is playing until May 13th, 2017 at the BMO Incubator in The Theatre Centre (1115 Queen Street West). Two Birds One Stone alternates with El Retorno/I Return Tuesday to Saturday at 7 PM and 9:30 PM. For specific times and dates, please visit here. This show is approximately 70 minutes long with no intermission. Ticket are $15, with any two RISER shows for $20, and can be purchased online, by phone at 416.538.0988, or in-person at The Theatre Centre Box Office (1115 Queen Street West) two hours before showtime. Photo of Rimah Jabr and Natasha Greenblatt by Dragana Paramentic.